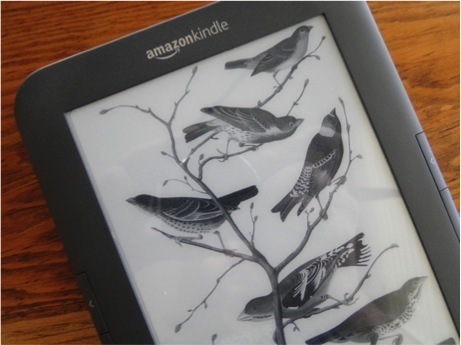 When The Kindle first came out, i wasn’t convinced i’d like it. I was worried about how reading from a screen would effect my eyes and positioning, i was a bit confused about how it would all work, and it seemed really impersonal; there’s something nice about a book, the smell of it, the feel of it, the place you find it. I like paper, it’s familiar, almost romantic. I was also put off by the £100 price tag – what if i didn’t like or use it? I was convinced to give it ago when i got a smart phone. If you have one (or an iphone), you can download The Kindle app for free. You can also download tons of books FOR FREE, from The Complete Works of Shakespeare, to The Bible. This is a big tick for kindle, natch. If you have the app on your phone, chances are you have it with you wherever you are. Whenever you find yourself with a spare few moments, you can read- a big plus for me, someone who is always forgetting to bring her book along. Its much easier to fit a phone than the works of Dickens in your handbag. If someone recommends a book to you at 4 o’clock in the morning, you don’t have to remember to pop into W.H Smith, and rely on them having it, when you’re in town next Thursday. You can buy it there and then. Books seem to be quite cheap on there, i guess because they don’t have production and delivery costs. You can get a sample of a book before you buy it – for free. Books don’t need a bookshelf – or any physical space at all! You can’t take it in the bath. I love love LOVE to read in the bath. The apps and store might be a bit tricky to navigate if you are a technophobe. The screen is small. You can make the font bigger but then you have to turn the page every 2 seconds (not a problem if you have the hactual kindle machine though, rather than the phone app). You can’t read very easily in the glaring sun (the kindle machine has a special screen to stop this though, so as above, only a problem with the app). The books tend to take up a lot of phone space (again, as above, not with the device). Not a kindle convert..sozzzzz 🙂 but I do read my books on my blackberry playbook now 🙂 and I download them illegally. Lolx.shame on me? :people nice article tho, makes me wanna buy one. Shhhh…don’t tell anyone, but my book’s published on Kindle, but I don’t own one — I can’t read my own book — ahahahaha! You’ve sold me! I will get one soon. I ADORE my Kindle.. had it for almost 2 years and it is the BEST thing ever! I move around a lot and being able to take my complete book collection anywhere I go is just the BEST.